Computational Flâneur is a site-specific generative poetry walk built for San Francisco's Fort Mason. It is available as a free download on the iOS App Store. 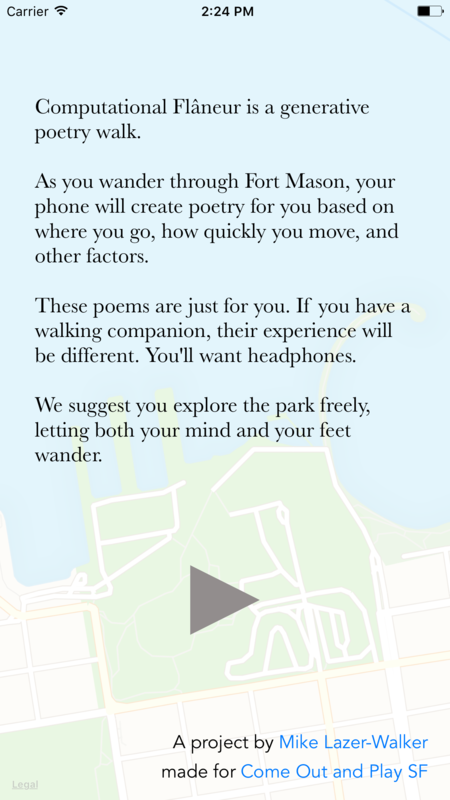 As you wander through Fort Mason, your phone creates and reads you poetry based on where you are in the park. Walk by the waterfront, for example, and you'll hear poems of the sea; walk by the cannons and you'll hear war poems. Inspired by the 19th century urban act of flânerie, the app aims to provide a meditative experience akin to doodling. The poetry it generates is not so interesting as to fully command your attention, but it is interesting enough to pull yourself out of your thoughts and instead focus you on your surroundings. Computational Flâneur was built for the 2016 Come out and Play festival. Its source code can be found on GitHub.